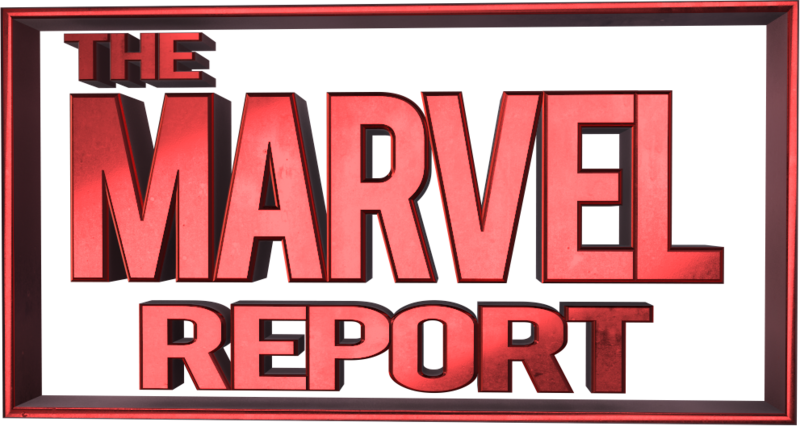 Previously on Captain America: Civil War, Tony and Steve disagreed about signing the Sokovia Accords and Bucky was framed for murder. Now it’s an all-out (you guessed it) war between the heroes, and Iron Man has recruited the newly branded Spider-Man to join the fray. Plot: If you’ve watched Captain America: Civil War, then you know the story. Spider-Man Homecoming Prelude #2 opens with the two sets of heroes facing off at Leipzig International Airport, followed quickly by Peter Parker’s introduction to the world of superhero blowouts. Our teenage Spider-Man webs up some frienemies and gets knocked down in turn, getting a black eye and some new web-shooters for his trouble. What happens next? Only Spider-Man Homecoming will have the answers – in a theater near you. Story: The vast majority of Spider-Man Homecoming Prelude is a direct adaptation of Captain America: Civil War, as was previously noted. While the first issue had a few extra Peter Parker scenes that provided some insight into his day-to-day routine, the second half of this limited series focuses primarily on the battle sequence in the airport hangar. It was a highlight of the film that still translates nicely to the page, but it can feel pretty repetitive if you’ve seen the movie recently or more than once. What makes the story more interesting is Peter’s thought process and narration, which makes an appearance on every page that he himself does. There are no groundbreaking revelations about his backstory or motivation, but Will Corona Pilgrim has a knack for Peter’s voice – or at least his voice as played by Tom Holland. Both issues are in character and give a rather humorous perspective on the Civil War, given that it’s one very sticky sixteen year old’s option on it. 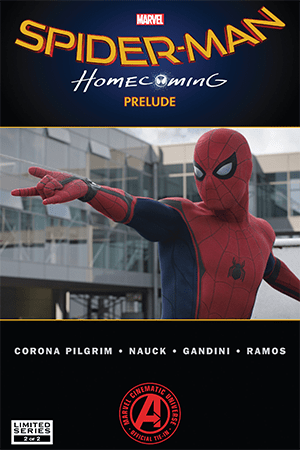 Art: The other reason to check out the Spider-Man Homecoming Prelude comic is the artwork, not that you can tell from the uninspired covers. Todd Nauck’s character designs look similar enough to the actors to be recognizable even without helpful title cards, but still manage to take on a life of their own. Meanwhile, Vero Gandini & Jay David Ramos provide vibrant and bright coloring that especially helpful when dealing with a fun-loving hero like Spider-Man. 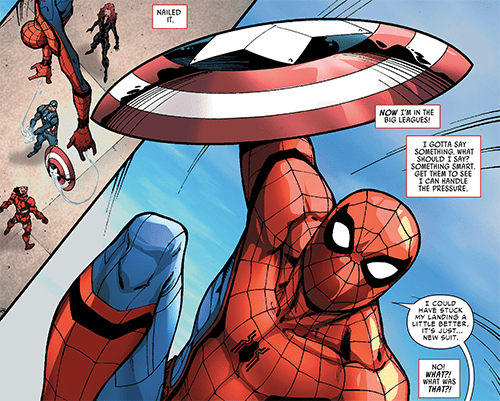 Perhaps there’s a little bit of a discrepancy, in that the art makes Spidey in his suit seem older than Peter himself. But that could also be the intention, since being a hero would age up even an innocent sweetheart like him. Regardless, the artwork gives readers something worth paying attention to in an otherwise rote tie-in issue. Verdict: Spider-Man Homecoming Prelude#2 is a must-have if you already picked up the first one and want to finish the story, or if you love retracing the steps of Captain America: Civil War with a slightly new perspective. But if you were hoping for more insight into Peter Parker’s life, or a chance to get to know the cast of characters before the movie comes out, this is not the comic for you.